This is by far the best loom knitting book designed specifically for the Knifty Knitter looms. It has instructions for advanced stitches and projects and may not be suitable for beginners. If you are looking for a book to help you understand the connection between standard needle knitting and loom knitting, this is the right book for you. 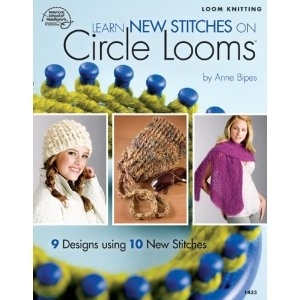 This book is titled "Learn New Stitches on the Circle Looms," but what those new to loom knitting should know is that almost any stitch done on a circle loom can be done on a long loom also. The one exception is a hat pattern in this book that couldn't be made on a circle loom because it weaves the yarn back and forth across the width of the circle to make a weaved top. There is literally something for everyone in this book. It begins by introducing the most basic loom knitting stitches and ends by showing more gorgeous advanced stitches that you can use to show off your knitting skills.